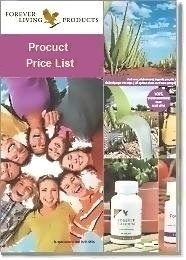 Forever Lite Ultra with Aminotein is the perfect addition to your healthy Forever Living lifestyle. Two shakes provide 100% RDI of numerous vitamins and minerals. About 15 servings per bag. Forever Lite Ultra with Aminotein integrates new thinking with new technologies to help you maintain a healthy diet and lifestyle. It supplies the 18 important amino acids, including essential, non-essential and the branched-chain amino acids. 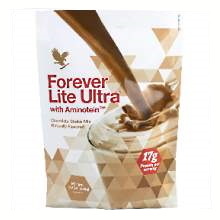 Two servings a day of Forever Lite Ultra with Aminotein Vanilla or Chocolate, prepared with skim milk as directed, supply a full 100% of the Reference Daily Intake (RDI) for the vitamins and minerals shown in the Nutritional Information sections. 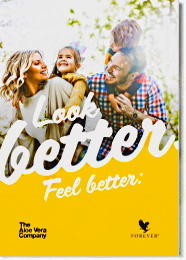 Forever Lite Ultra with Aminotein is also an integral part of Forever Living’s Clean 9 and F.I.T. weight management programs. It will help you take charge of your health and put you on the path to effective and sustained weight management! 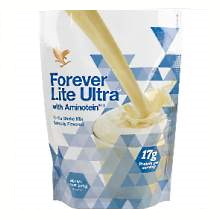 Both Forever Lite Ultra with Aminotein® *** Vanilla and Chocolate flavors contain Soy. **Amount in powder. Ten fluid ounces of skim milk contributes an additional 126 calories, 181 mg sodium,17 g total carbohydrate (17g sugars), and 10 g protein. *** Aminotein® and Aminogen® are registered trademarks of Triarco Industries. *** Aminogen® is protected by U.S. Patent No. 5387422.